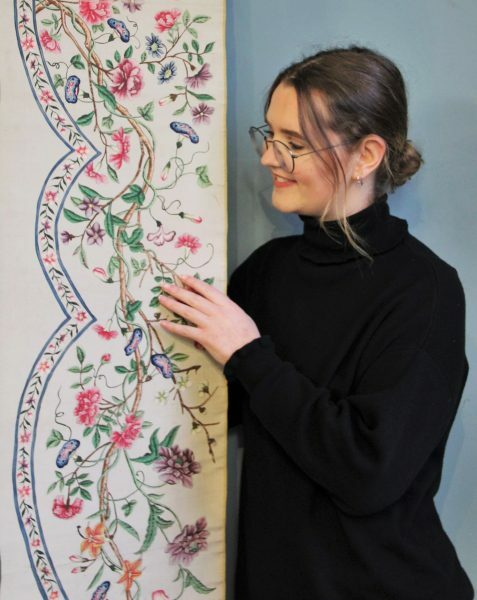 ‘Chinese wallpapers and fabrics appeared for sale in London in the late 17th century. These hand painted papers and silk and the Chinoiserie decorative styles they inspired, sparked a fashion that lasted more than a century. Most of the great houses of Europe had at least one room decorated in the Chinoiserie style, if you’ve ever visited Brighton Pavillion you will have seen it in abundance, by the end of the 18th century they were to be found in most modest sized houses too, such as at the National Trust property Erddig, just outside Wrexham, where you can see stunning Chinese bed hangings and wallpapers in the State bedroom which were bought by John Meller in 1720. The popularity of these Chinese silks was part of a wider ‘Sinomania’ – a fashion for all things Chinese. The appetite for oriental exotica was fed by the import of Chinese decorative goods and written accounts at the time that presented China as a sophisticated model society to rival Greece or Rome. The enthusiasm for the Chinoiserie style was reflected in its widespread use in 18th-century decoration. There was a playfulness and informality in the style that made them popular decorations for bedrooms and apartments, especially those used by women. But the enthusiasm for Chinese wares was not universal. A taste for Chinese styles became associated with the nouveaux riches who had made their money in trade. As the English poet William Shenstone put it, ‘A mere citizen is always aiming to show his riches…and talks much of his Chinese ornaments at his paltry cake house in the country’. Chinese textiles became associated with a vulgar parade of wealth, rather than with elegant and refined tastes. Some also saw the Chinese imported textiles as a threat to the livelihoods of English textile workers. 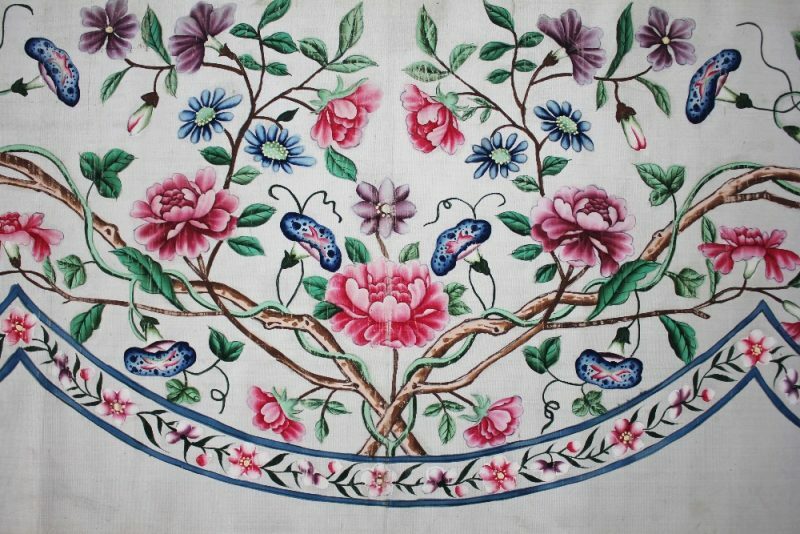 By continuing to pay close attention to the tastes of the European market, by modifying designs and introducing new patterns, motifs and colours as required, Chinese textile manufacturers prevented the trade from stagnating. Specific orders such as the material that we saw here at Trevanion & Dean would have been a commission from a wealthy patron and would have been an expensive luxury, commissions such as this which requested certain patterns or colourways could take up to 18 months to be delivered, which makes it even more remarkable that they were never utilised in the scheme for which they were intended. It may have been that the silk panels that we have here at Trevanion and Dean arrived as the style was becoming passe towards the end of the 18th century, that by the time the silk finally arrived, another furnishing scheme had been settled upon. From our perspective it is quite wonderful that the material panels we have here were never used, as it means that we see the colours as they were supposed to be rather than the muted, sun faded colours that we so often see now. The colours are still so bright and so vibrant, exactly as they were intended to be seen over three hundred years ago’.